The International Malleable Iron Company (IMICO) manufactured malleable grey and ductile iron castings in Guelph. IMICO was an iron foundry opened in 1912 by the Carver family, which had emigrated from England and later settled in Canada and the United Stated. The IMICO plant was located at 200 Beverley Street in Guelph and occupied a 7.5 acre site. IMICO produced custom sand casting molded products for the automotive, rail, agricultural and energy sectors. By 1947, IMICO employed 500 employees. In 1988, IMICO had sales of approximately $20 million to $25 million and employed 250 workers. IMICO declared bankruptcy and abandoned the Beverley Street site in 1989. With the plant closure, two hundred and thirty workers lost their jobs. The contaminated site was sold by IMICO's American parent company to a local business man for a dollar. The custodial history of these records, prior to their transfer to the Guelph Public Library archives is not known or documented. Fonds consists of records created, collected and maintained by the International Malleable Iron Company IMICO during the course of its operations in Guelph. 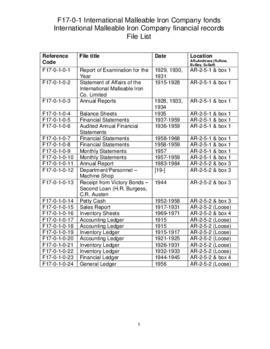 Included in the fonds are financial records, photographs, employee records, minutes and other corporate documents. These records were acquired from the Guelph Civic Museum in July 1991. Access to some records in this fonds is restricted. See series descriptions for more details. Copyright for these records is not held by the Guelph Public Library. Please contact the Guelph Public Library archivist about how to obtain the necessary copyright permissions. Other photographs are now in the public domain. See series description for available photographs. Records related to the International Malleable Iron Company can also be found at the Guelph Civic Museum.